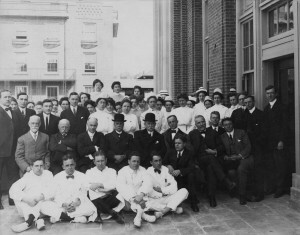 First staff with Sir William Osler at dedication of the Peter Bent Brigham Hospital, April 30, 1913. 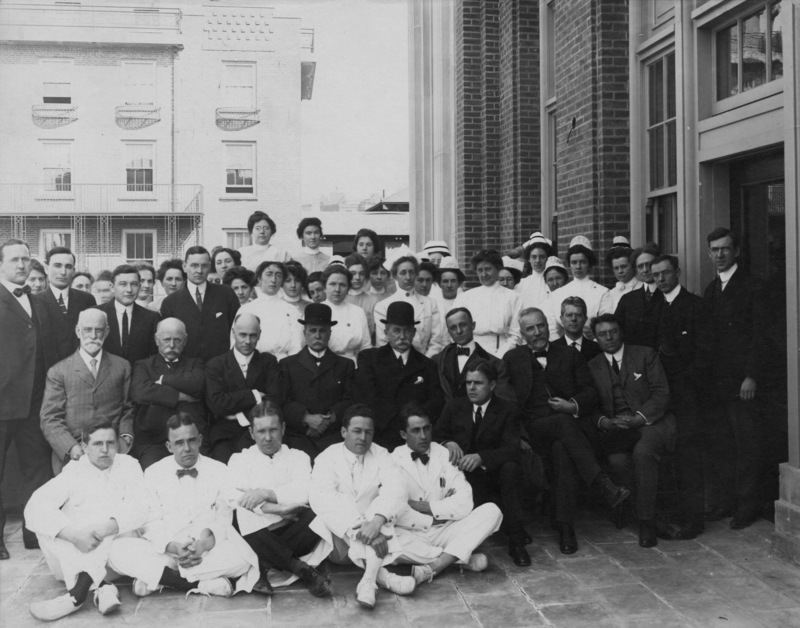 The Peter Bent Brigham Hospital collection includes much of its early administrative data, going back as far as 1902, when the corporation to construct the hospital was formed and its close relationship with Harvard Medical School began. 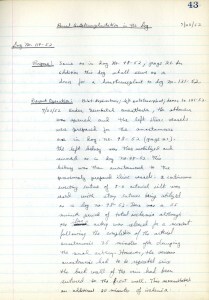 All of the hospital’s Annual Reports (1913–1979), Executive Committee Meeting Minutes (1912–1980), and Board of Trustees meeting records (1902–1975) tell the story of the growth of a major metropolitan hospital from its opening in 1913 through the development of modern medicine during the greater part of the 20th century. The collection also includes records of the Peter Bent Brigham Hospital School of Nursing (1912–1985), which became one of the preeminent training programs for nurses in the United States. Other hospital publications codify hospital procedures and standards over time, and the newsletter, Brigham Bulletin, adds depth to the hospital’s biography with weekly, more personal stories about the individuals and events that made the organization unique. The collection includes 1911 construction records for the original 225-bed, pavilion-style hospital built along Francis Street in Boston, as well as for later additions. 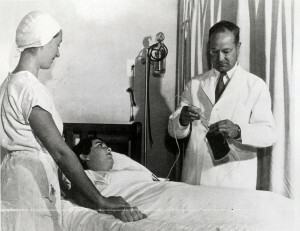 Photographs comprise the largest portion of the collection and provide thousands of images of hospital, staff, and activities from 1911–1980. 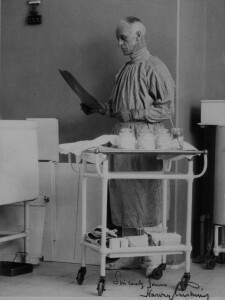 The archival collection includes images of some of the individuals whose work at the Peter Bent Brigham Hospital significantly advanced medical science and education, including: Dr. Francis Moore, considered the “father of modern surgery;” Dr. Harvey Cushing, first PBBH Surgeon-in-Chief, an innovator in neurosurgery; Dr. Samuel A. Levine, a key figure in modern cardiology; Nurse Carrie M. Hall, a leader in the evolution of professional nursing education; Dr. (Brigadier General) Elliott C. Cutler, second PBBH Surgeon-in-Chief and Surgeon-in-Charge of the European Theater of Operations during WWII; Dr. Carl Walter, who developed a way to collect, store, and transfuse blood; and Dr. Joseph E. Murray, the 1990 co-recipient of the Nobel Prize for Physiology or Medicine. He, along with his team of PBBH medical pioneers achieved the first successful kidney transplant in 1954. Many interesting hospital related artifacts are part of the collection. A menu and china from founder Peter Bent Brigham’s restaurant, a World War I service flag and many of Nurse Carrie Hall’s service medals from the same war; mid-century nurse’s uniforms, caps, and capes; scrapbooks, audio recordings, newspaper clippings, old medical instruments, student notebooks from the nursing school, and the contents of the PBBH 1963 time capsule are some of the widely various objects that can be found here. A new Center for the History of Medicine exhibit, Reconstructing Lives, is now available through the Center’s online collections site, OnView. The exhibit features items from the Joseph Murray papers and traces Murray’s life from his time as a student at Harvard Medical School and an Army surgeon during World War II, through his groundbreaking work in organ transplantation and plastic surgery. He received the 1990 Nobel Prize in Physiology or Medicine for his work on organ transplantation, served as Director of the Surgical Research Laboratory at Harvard Medical School and at Peter Bent Brigham Hospital, was head of the plastic surgery departments at Peter Bent Brigham Hospital and Children’s Hospital Boston, and was a Professor of Surgery at Harvard Medical School. OnView allows the user to view the exhibits as he or she would in the physical space, moving from item to item within the framework of the narrative. Individual items, collections, and exhibits can also be browsed and searched using subject terms and tags. The Center has also been working to migrate legacy exhibits into OnView. 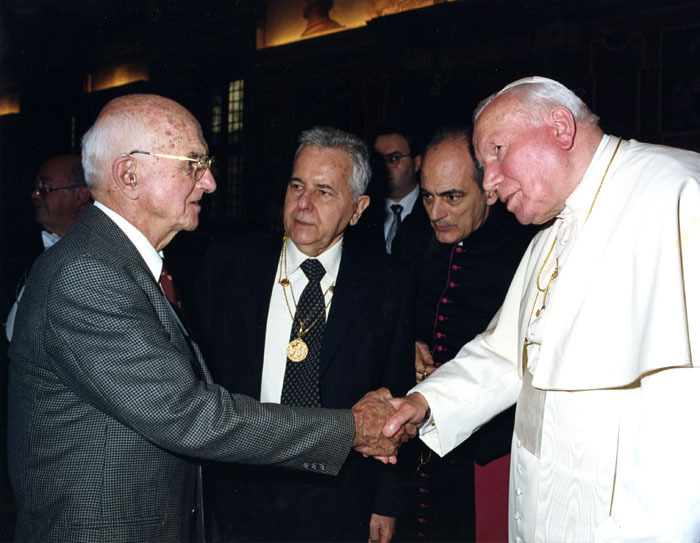 The finding aid for the Joseph Murray papers can be found here. For information regarding access to the collection, please contact the Public Services staff. 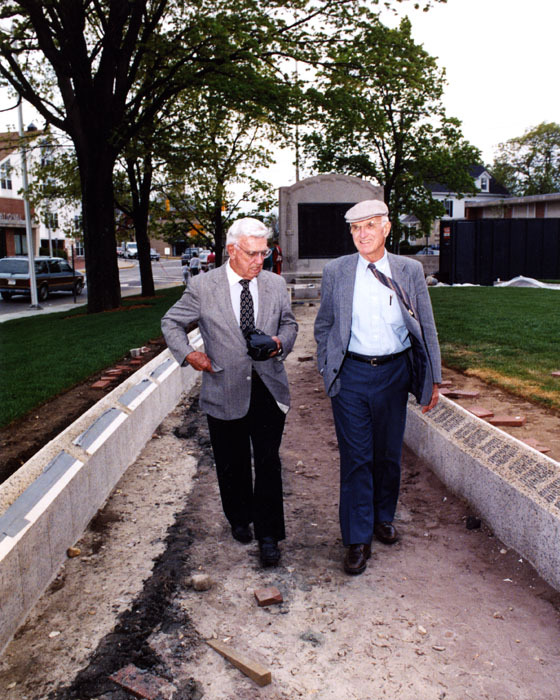 Joseph Murray (1919-2012) and Bradford Cannon (1907-2005) first met at the Army-run Valley Forge General Hospital during World War II. 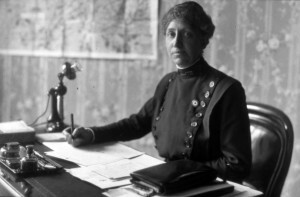 After the war, both returned to Boston (Murray to Peter Bent Brigham Hospital and Cannon to Massachusetts General Hospital) and had distinguished careers in plastic and reconstructive surgery. In the video below, entitled “Plastic Surgery at Harvard Medical School”, the two discuss their careers. 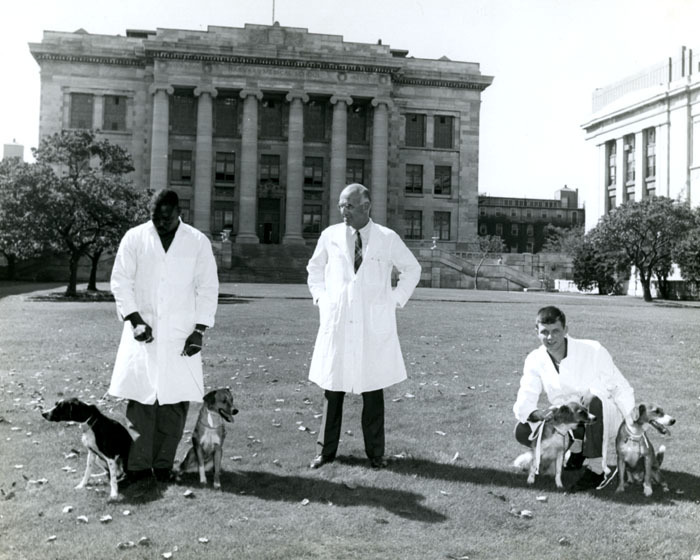 The video was produced by the Boston Medical Library as part of the series “Leaders in American Medicine”, and will be part of a Center online exhibit about the life and career of Joseph Murray, which will be available later this fall. 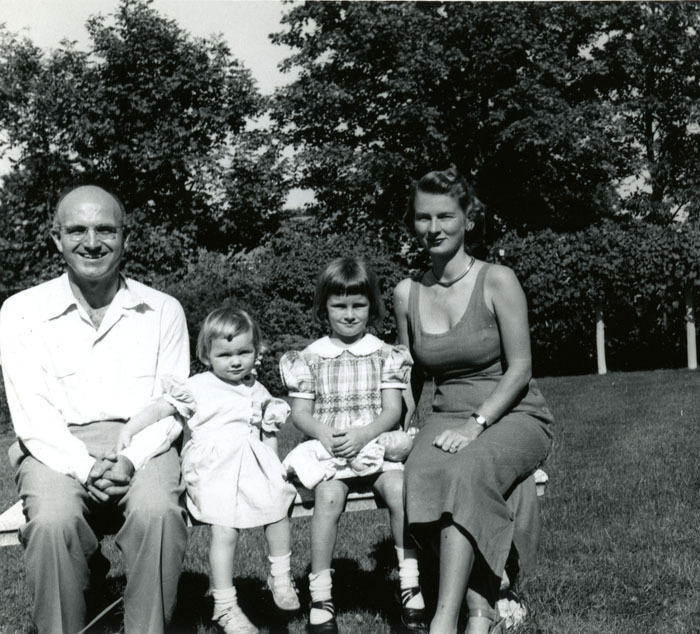 The video is part of the Joseph E. Murray papers and was recently digitized. The Center holds both the Joseph E. Murray papers (finding aid here) and the Bradford Cannon papers (finding aid here). For information regarding access to these collections, please contact the Public Services staff. 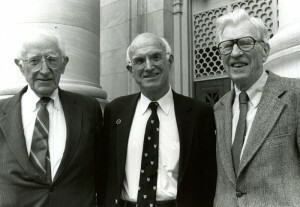 Francis D. Moore, Joseph Murray, and George Thorn. Date unknown. 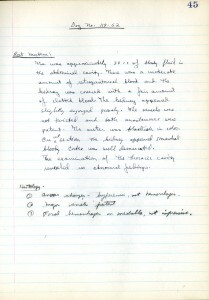 One of the Center’s acquisitions goals is to develop collections that are uniquely deep and rich in connections, providing a view into biomedical and public health disciplines, research areas, communities, and practices via published and unpublished sources– personal papers, professional association records, institutional archives, ephemera, images, and objects. Several of these clusters are well-known; the Historical Collection in Radiology, for example, encompasses rare books extending to the earliest development of radiology, manufacturers catalogs, images, scientific apparatus, and the records of the Fleischner Society and American and New England Roentgen Ray Societies, as well as manuscript collections including those of Felix Fleischner, Morris Simon, Merrill Sosman, Charles L. Dunham and Lauriston Taylor. The Center continues to build on this strong foundation and opened many of these manuscript collections over the past two years (see recent blog posts). More collections will be opened next year. Another cluster of collections recently opened by the Center are those in hematology (the diagnosis, treatment, and prevention of diseases of the blood and bone marrow as well as of the immunologic, blood clotting, and vascular systems). The Harvard medical community was the site of some major advances in hematology, including William Parry Murphy’s research concerning various hematological diseases, notably pernicious anemia, leukemia, and diabetes mellitus. With George Richards Minot (1885-1950) and George Hoyt Whipple (1878-1976), he is credited with developing a treatment for pernicious anemia using a diet of uncooked liver, for which all three were awarded the 1934 Nobel Prize for Physiology or Medicine. Murphy later worked throughout his career to refine the liver extract developed by Edwin Joseph Cohn (1892-1953) and George Richards Minot for the treatment of pernicious anemia. In 1941, Cohn, working with T.L. 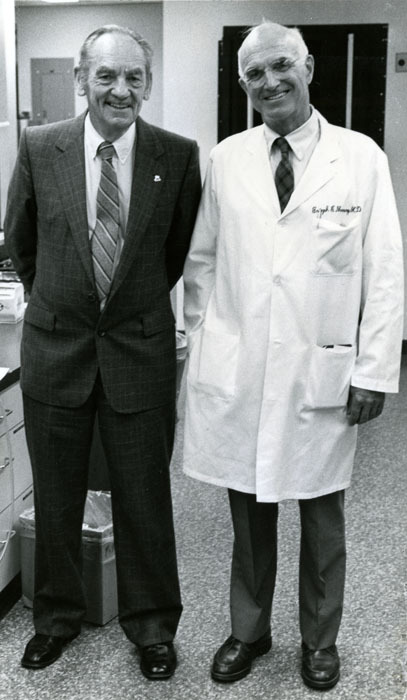 McMeekin and John L. Oncley (1810-2004), developed a method of fractionating blood plasma proteins to extend the storage life of blood and use blood proteins more efficiently. More recently, William Dameshek is credited with proposing a technique for bone marrow extraction using a needle, collaborating in the first known multi-institutional chemotherapy trial, and developing treatments for various autoimmune diseases. With Yuet Wai Kan, David G. Nathan introduced the first prenatal diagnostic test for thalassemia and sickle cell anemia. He is also known for introducing deferoxamine as an effective treatment of iron overload and hydroxyurea as a treatment for sickle cell anemia symptoms. Collections in boldface were recently opened; more collections are on the way (see blog posts for details). Surgery is another area in which we are assiduously acquiring and striving to open collections. Earlier this year, Joseph Murray‘s papers were opened to research, joining the collections of plastic surgery pioneer Varaztad Kazanjian, Edward Churchill, Elliot Cutler, Louis T. Wright, the first black appointed to the staff of a New York hospital, Maurice Howe Richardson and his son, Edward Pierson Richardson, William Bovie, American Association of Plastic Surgeons, the New England Vascular Surgery Society, and many others. We are currently processing the Judah Folkman and Dwight Harken collections, but are still seeking resources to prepare for research access the extensive personal and professional papers of Francis D. Moore. Of greatest concern are the number of living ‘greats’ whose papers have yet to be acquired. Building the powerful research collections that fuel ground-breaking research demands the active support of the whole community– everyone from physicians, health professionals, scientists, administrators, lab managers, researchers, and all those who are interested in the advancement of knowledge. In addition to surgery, we are currently collecting in genetics, immunology and infectious diseases, public health, and other fields. We rely on you to alert us to important collections and objects in your field that might be of interest, particularly where those materials might be at risk. Want to know more about the Center’s holdings in your discipline? Go to the Harvard Library simple search portal, enter your keyword, and click on “Go.” Your findings will be delivered on a Hollis results page; there are many options to refine (narrow) results, including location (select ‘Countway’) and format (choose ‘Archives/Manuscripts’). For assistance, contact the Center’s public services librarians at 617-432-2170 or email to chm@hms.harvard.edu. 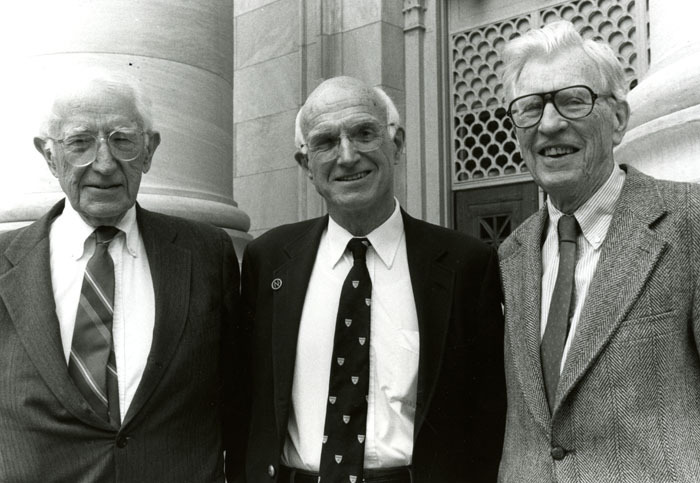 The Center for the History of Medicine is pleased to announce the opening of the Joseph E. Murray papers, 1919-2011. 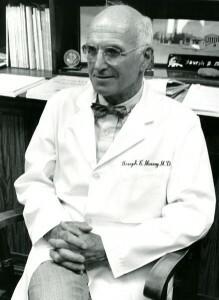 The papers are the product of Murray’s activities as a plastic surgeon, transplant surgeon, laboratory director, author, and Harvard Medical School alumnus, and include records from Murray’s plastic surgery and transplantation work at the Peter Bent Brigham Hospital and Children’s Hospital Boston. The collection also contains his personal and professional correspondence, records from his activities as chairman of the Harvard Medical Alumni Fund, records from reunions of the Harvard Medical School class of 1943b, as well as Murray’s professional writings. 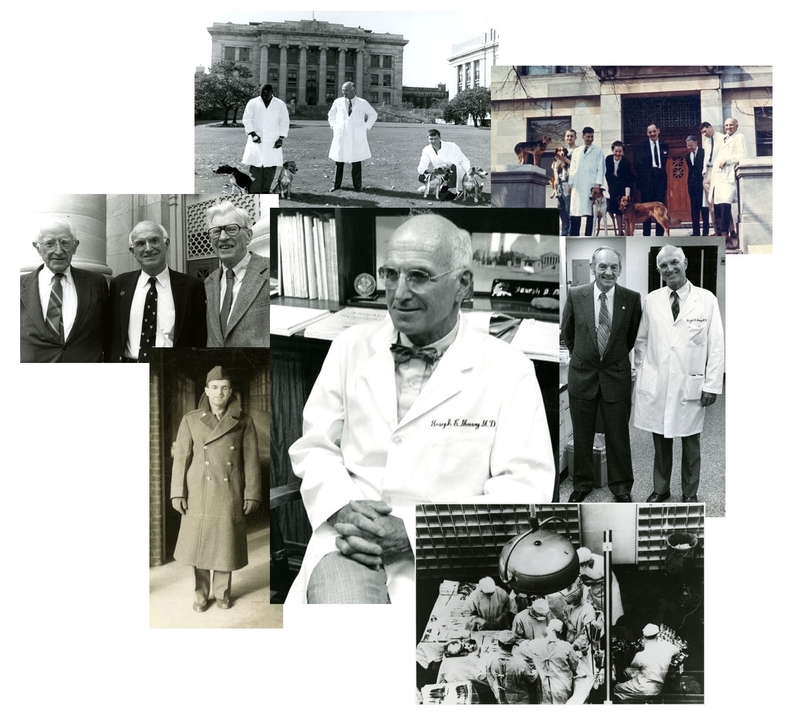 Joseph E. Murray (1919-2012), A.B., 1940, College of the Holy Cross, Worcester, Massachusetts; M.D., 1943, Harvard Medical School, Boston, Massachusetts, transplant and plastic surgeon, received the 1990 Nobel Prize in Physiology or Medicine for his work on organ transplantation. 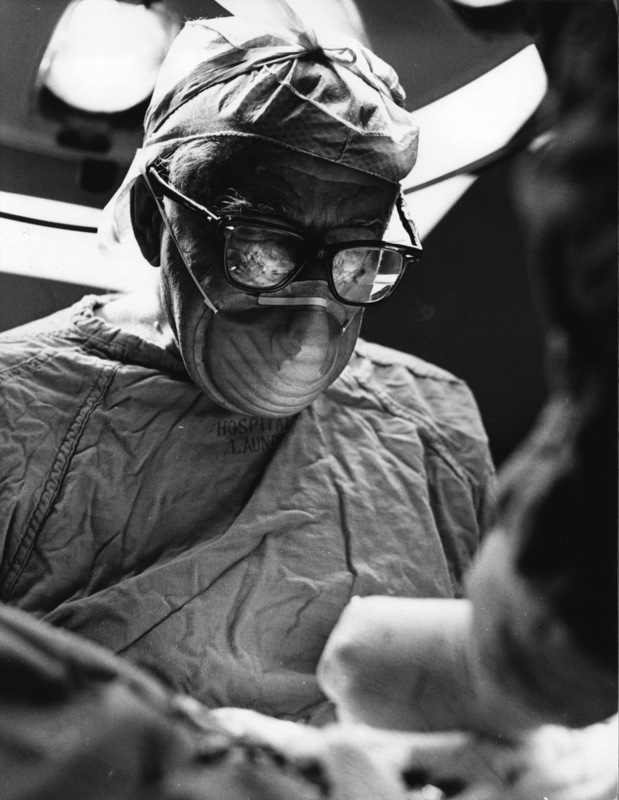 Murray served as Head of the plastic surgery departments at Peter Bent Brigham Hospital and Children’s Hospital Boston, Chief of Transplant Surgery at Peter Bent Brigham Hospital, and Director of the Surgical Research Laboratory at Harvard Medical School. 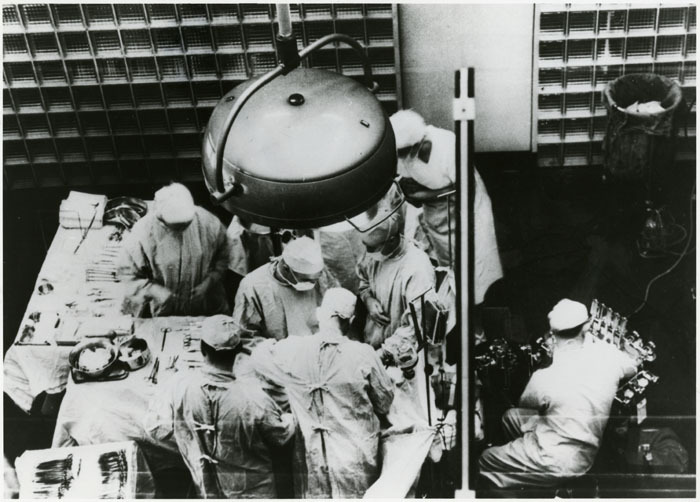 In 1954, Murray performed the first successful human organ transplantation, between identical twins, Ronald (donor) and Richard (recipient) Herrick, at the Peter Bent Brigham Hospital. The Center was saddened to learn of the passing of Dr. Joseph E. Murray on Monday at Brigham and Women’s Hospital. 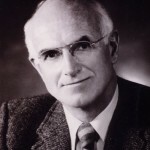 Dr. Murray is best known for performing the first successful organ transplantation in 1954, for which he was awarded the Nobel Prize in Physiology or Medicine in 1990. A graduate of Holy Cross (A.B., 1940) and Harvard Medical School (M.D.,1943), Murray served at Valley Forge General Hospital in the Army Medical Corps during World War II. It was there, observing how donor skin grafts on badly burned soldiers were rejected by their bodies, that Murray first became interested in transplantation. In 1962 he performed the first cadaveric renal transplantation, utilizing the newly developed immunosuppressant drug Azathioprine. 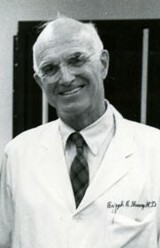 Despite his role in organ transplantation, Murray spent the majority of his career in the field of plastic surgery, serving as the head of plastic surgery at the Brigham and at Children’s Hospital, as well as director of the Surgical Research Laboratory at Harvard Medical School (an earlier Center blog post about transplantation and Dr. Murray’s involvement with the Surgical Research Laboratory can be found here). 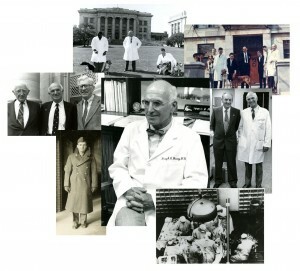 Obituaries for Dr. Murray can be found at boston.com, the New York Times and the Washington Post. His autobiography, Surgery of the Soul, was published in 2001. The Center holds the Joseph E. Murray Papers, which are currently being processed for research access. The collection is expected to be open to researchers in early 2013. Below are selected images from the collection. 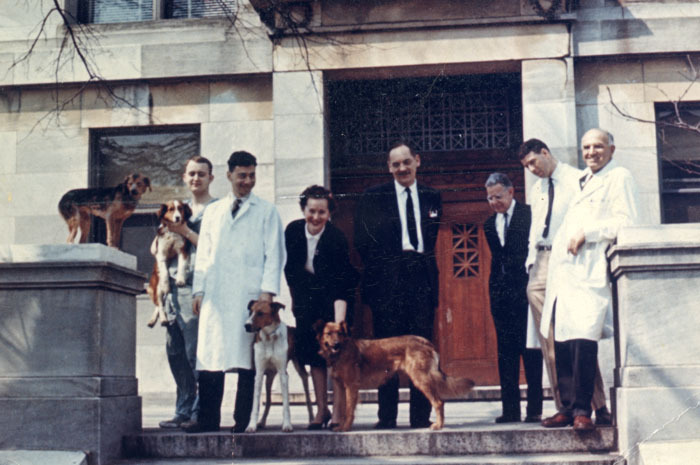 Joseph Murray (far right) with Roy Calne (second from left), future 1988 Nobel Laureates Gertrude Elion and George Hitchings (third and fourth from left, respectively), and surviving transplant dogs. 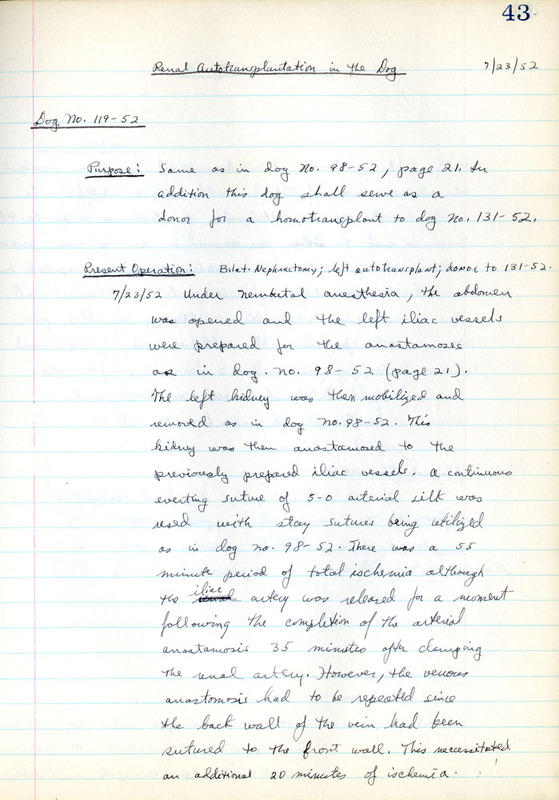 Staff at the Center recently discovered notebooks from the Surgical Research Laboratory while processing the Joseph E. Murray Papers. 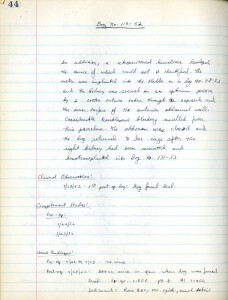 Of particular interest are two notebooks detailing the work of Murray and his colleagues to refine surgical techniques for kidney transplantation in dogs, which lead to the development of the procedure used for humans. 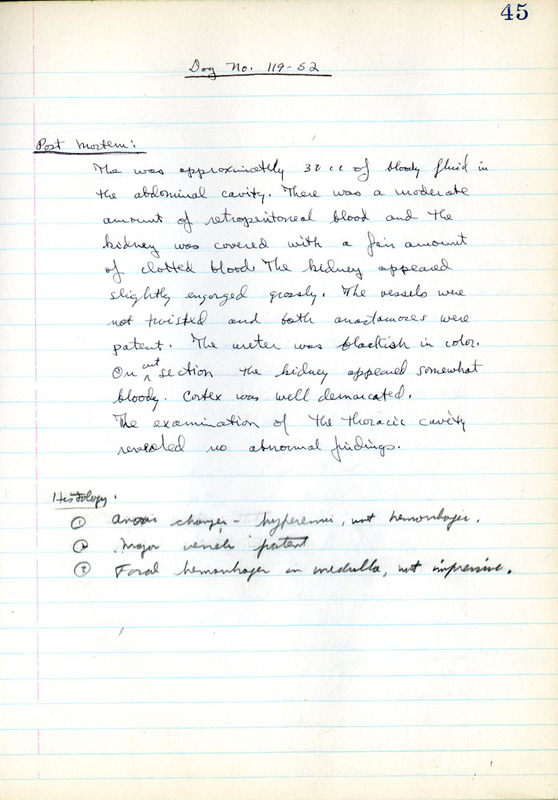 These notebooks date from 1952 to 1954; the first successful human kidney transplant, performed by Murray, took place in December 1954. A sample detailing a renal autotransplantation procedure on a dog can be seen below. 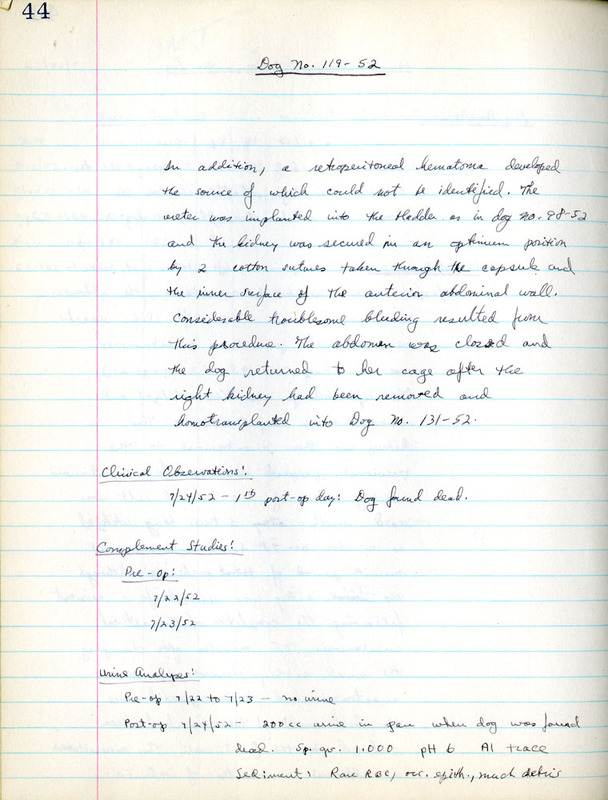 The notes include a description of the operation as well as a postmortem. The Surgical Research Laboratory, located on the Harvard Medical School Quadrangle, was founded in 1912 by Harvey Cushing, surgeon-in-chief at the Peter Bent Brigham Hospital. The lab functioned as a place for animal-based surgical research, as well as a place for medical students to receive surgical experience. 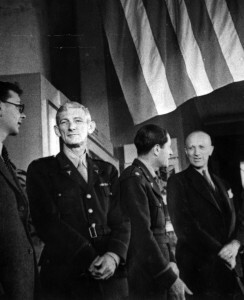 Members included Elliott Cutler, Carl Walter, Francis Moore, and Dwight Harken. 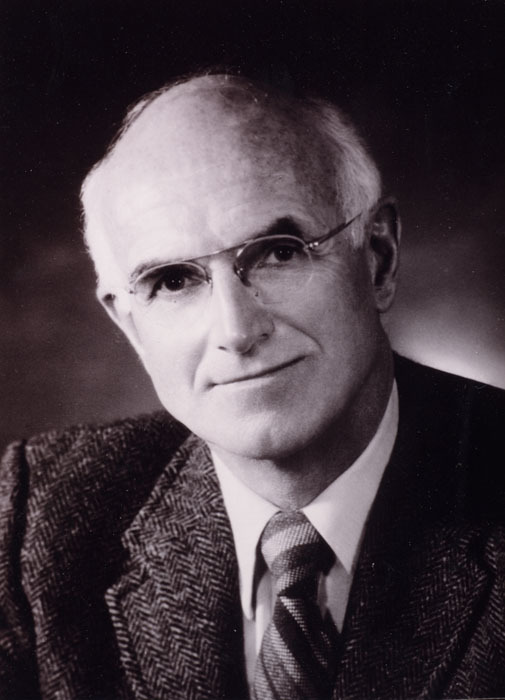 Murray was director of the lab from 1952-1975. The lab closed in 2001. 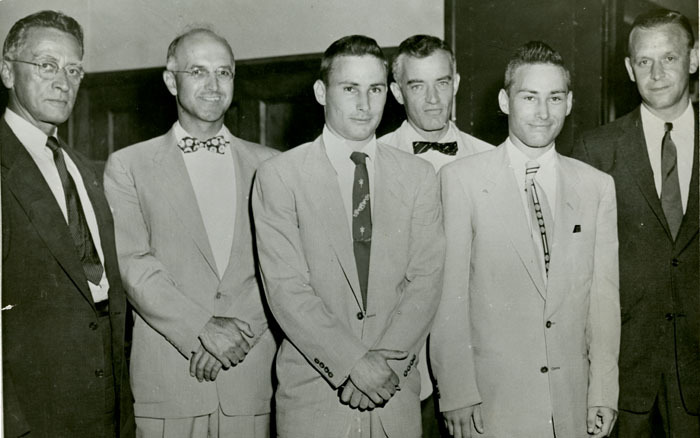 The Joseph E. Murray Papers are expected to be opened to research in early 2013. Center staff has recently started processing the Joseph E. Murray Papers, which date from 1916 to 1999 and span his entire professional career as a surgeon. 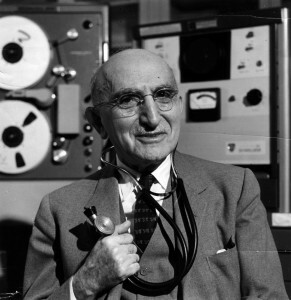 Murray (M.D., 1943, Harvard) was Professor of Surgery and director of the Surgical Research Laboratory at Harvard Medical School and Chief of Plastic Surgery at Brigham Hospital and Children’s Hospital. He led the surgical team that performed the first successful human organ transplantation in 1954 and received the Nobel Prize in Physiology or Medicine 1990 for his work on organ transplantation. The collection includes Murray’s professional correspondence, research records, hospital records, and scholarly writings. It also contains records from his involvement in professional organizations and Harvard Medical School alumni activities, as well as a number of non-paper records, including films, dental models, X-Rays, videos, and lantern slides. The audiovisual (AV) records in the collection have already been surveyed by technicians from the Weissman Preservation Center as part of a systematic assessment of AV materials in special collections at Harvard. The collection is currently scheduled to be opened in early 2013. This list of potential risks posed an ethical dilemma for us. While we routinely asked patients to incur some risk in order to achieve a benefit for themselves, none of us had ever asked a healthy person to accept this magnitude of risk solely for the sake of someone else. We consulted with experienced physicians within and outside of the Brigham, clergy of all denominations, and legal counsel before offering the option of transplantation. 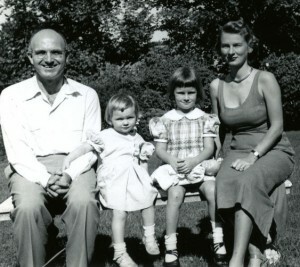 The team met several times with the family to describe in detail what was involved for Ronald and Richard. We advised neither for nor against the operation, and we stated the obvious: We could not know if it would work. Joseph Murray (B.A., 1940, Holy Cross College, M.D., 1943, Harvard) was Professor of Surgery at Harvard Medical School and Chief of Plastic Surgery at Brigham Hospital and Children’s Hospital. 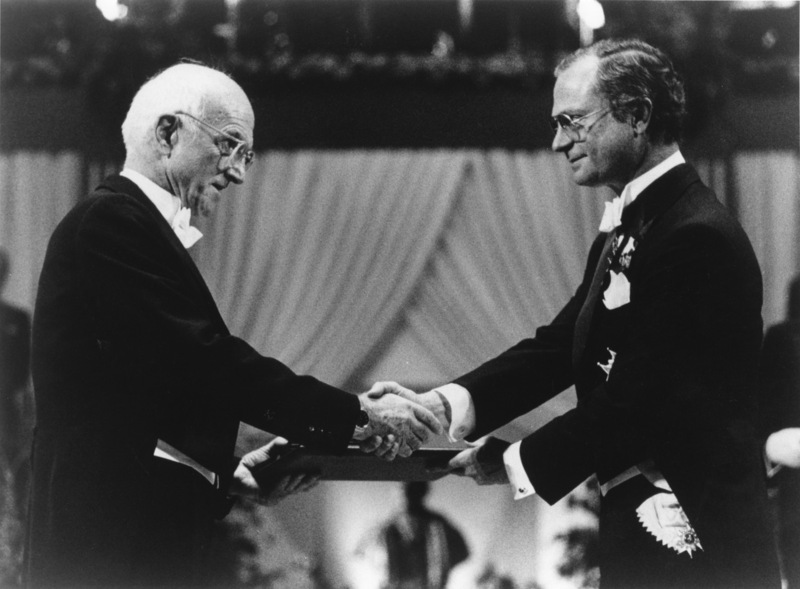 He received the Nobel Prize in Physiology or Medicine 1990, for his work on organ transplantation. The Center holds the Joseph E. Murray Papers, 1919-1999. For information regarding access, please contact the Public Services staff. Joseph Murray (third from left), performing the first successful organ transplant at the Peter Bent Brigham Hospital, Boston, MA, December 23, 1954. UPDATE: The Harvard Gazette interviewed Dr. Murray about the 1954 transplant as part of a series celebrating Harvard’s 375th anniversary.